For thousands of years, people have turned to Traditional Chinese Medicine to treat and heal a variety of medical conditions. Yet, while Western medicine has not been in existence as long, it is often seen as the gold standard in terms of medical care. But Dr. XiPing Zhou sees great value to both approaches. 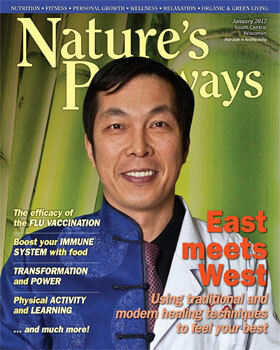 Zhou earned a doctorate in Oriental Medicine (OMD), a 5-year degree that allows him to practice both types of medicine there. He is also a licensed acupuncturist with a bachelor of science degree in medicine, which he earned from HeiLongJiang University in the Peoples’ Republic of China. In July 1993, while serving as chief physician and professor at HeiLongJiang Medical College, Zhou was asked to visit the United States to speak at the National Conference of Acupuncture about his success treating stroke patients with paralysis. From 1994 to 2000, he taught acupuncture and Chinese medicine at the Midwest College for the Study of Oriental Medicine in Racine. In 1999, he joined the staff of Columbia St. Mary’s Hospital in Milwaukee, becoming one of the very first acupuncturists on staff at any Wisconsin hospital. Zhou established his private practice in Madison and Milwaukee in 1996 with only a small 500-square-foot office on University Avenue. Over the years, Dr. Zhou has successfully developed a reputable clinic and teaching institution (East-West Healing Arts Institute). Today his Clinic is a 6,500-square-foot natural healing center including two large classroom spaces and 12 feng shui-style private treatment rooms. Currently the center has eight professional massage therapists, three licensed acupuncturists and two traditional Chinese Medicine Doctors. The school teaches therapeutic and medical massage, specializing in the integration of Eastern and Western modalities. “The difference between our school and other schools is that we offer a complete integrated Eastern and Western massage therapy training and we have the most clinical hours in Wisconsin,” Zhou explains. The 800-hour program includes Eastern theory classes including introduction to Chinese medicine and herbology, theory of Eastern medicine and classic Chinese assessment techniques. Eastern practice includes extensive courses in TuiNa, or Chinese medical massage, acupressure point location and indication, Tuina and therapeutic massage for medical conditions and classes in Thai massage, reflexology, Zen Shiatsu and more. Western science classes include pathology and anatomy and physiology. Western massage methods taught include deep tissue, soft tissue techniques, CranioSacral Therapy (Upledger Institute style), sports massage, prenatal massage and more. Courses in professional ethics, business practices, and CPR/First Aid meet or exceed state guidelines for these topics. Acupuncture and massage are powerful healing and wellness tools that have the ability to increase quality of life for patients. Karen Zielinski learned of the efficacy of Eastern modalities when her daughter, Natasha, enrolled at East-West. “She started learning some of the techniques and she’d need to practice on me and I was totally impressed,” Zielinski says. About 10 years ago, Zielinski sustained numerous injuries from a car accident. Despite undergoing all kinds of traditional therapies, she had been suffering with debilitating headaches, pain, and numbness in her arm. She also became very depressed and just wanted to sleep all the time. A self-described skeptic with a medical background herself, Zielinski decided she had nothing to lose by seeing Zhou for acupuncture. Linda Roberts suffered from 4 herniated discs in her back. After trying epidural injections and physical therapy, she had a consult with a neurosurgeon who recommended she try acupuncture with Zhou. Traditional Chinese medicines including herbs, acupuncture, nutrition guidance and therapeutic massage can also help with reproductive problems, infertility, sleep disorders, GI issues and a host of other wellness issues. “My husband and I were trying to conceive our second child. We visited doctors for five years of fertility tests and treatments. I underwent biopsies and a hysterosalpingogram. I took all kinds of infertility drugs and tried two different types of artificial insemination, all with no success. I turned to acupuncture and herbal treatments with Dr. Zhou and two months later I was pregnant,” says Veronica Jackson. Erin Dyer has seen Zhou since 2007. She has received acupuncture treatments for pain due to osteo-arthritis, as well as nutrition counseling and help for her depression.